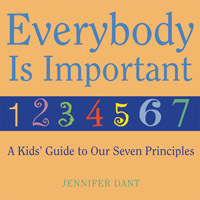 Helps children understand the seven Principles and how to live out these values every day. The Principles are cast in terms a child can understand, such as "Everybody is important" instead of "the inherent worth and dignity of every person." With attention to the spiritual needs of young children, Dant relates each Principle to the context of their lives, from playing with friends to helping care for pets. Illustrated in full color. Ages 5-7.